The authentic scented super soft, sleepy-eyed Chad Valley Tiny Treasures Twin Babies Bumper Set feel just like a new born weighing 2lbs 10oz. 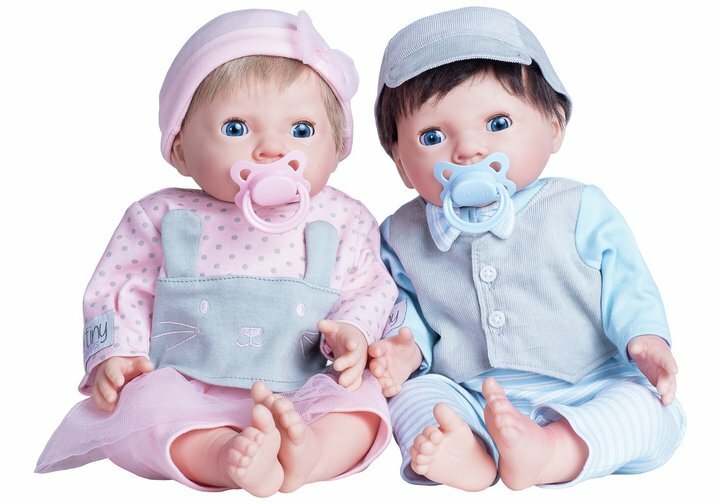 The sensationally realistic baby dolls with life-like facial features both look adorable with their dummies and dressed in party outfits, plus to help tell them apart one conveniently has blonde hair and the other brown! These lovely twins comes in car seat gift box with genuine straps as well as hospital tags and birth certificate for your little one to fill in. Get money off with April 2019 free Argos voucher codes, see if there's a discount code for the Chad Valley Tiny Treasures Twin Babies Bumper Set product. 5.0/5 from 11 recent reviews.